Home Biafra News BIAFRA: IPOB Shreds VP Yemi Osibanjo in New Press Release Over "ill Constitutional Statement"
BIAFRA: IPOB Shreds VP Yemi Osibanjo in New Press Release Over "ill Constitutional Statement"
We the members of the Indigenous People of Biafra (IPOB) under the leadership of Mazi Nnamdi Kanu condemn unequivocally the distasteful statement credited to the acting President of Nigeria Professor Yemi Osibanjo, to the effect that Biafra agitators who through the instrumentality of IPOB are exercising their God given and inalienable right to self-determination, is in violation of the provisions of the General Abdulsalami Abubakar 1999 Constitution of Nigeria. It is very shameful that a professor of law cannot situate the Nigeria constitution within the context and meaning of the right to self-determination as recognized in international law. Somebody should please draw the attention of Professor Yemi Osibanjo to the provisions of the Africa Charter on Human and Peoples Rights which Nigeria ratified and went ahead to domesticate into her local laws. How can a professor of law threaten jail term for those exercising their right to self-determination under laws adopted and ratified by Nigeria? This confirms again the widely held view that legal practice in Nigeria is one almighty joke. 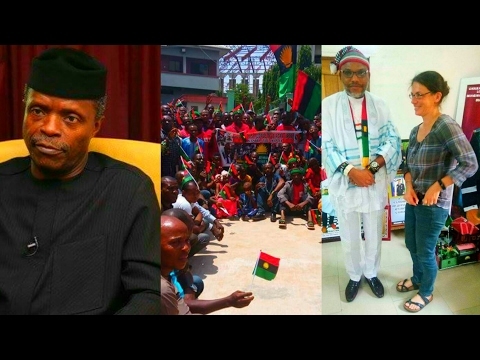 We are challenging Prof. Osinbajo to show the whole world how, where and when IPOB committed this offence he alluded to since the inception of the current phase of the agitation. The criminal political cabal that led President Buhari astray on the issues of Biafra agitation are at it again. By assuring Osinbajo that threatening language, mass arrests, illegal detention, killings and brutal crackdown will frighten IPOB into submission, this same group of corrupt criminals are setting up Osinbajo to fail the same way they caused Buhari’s failure. If Osinbajo continues to heed their evil counsel by using threatening language when addressing IPOB he will end up a failure like Buhari. Nigeria must understand how ready we are to go to prison. They should build more illegal detention facilities because we cannot stop agitating for our right to self-determination until the Nigerian government accepts the need for a date for a referendum on the question of Biafra. Professor Yemi Osibanjo should have consulted superior legal minds to advice him before coming on air to make such misleading comments. The Nigerian Constitution and its provisions cannot supersede international charters and treaties freely entered into by the Nigerian state where such treaties appear to render null and void the obnoxious provisions of the Nigerian Constitution. Those that wrongly advised Prof. Osinbajo to embark upon the citation of the ill-conceived constitutional reference to the indissolubility of the Nigeria, should refer to the landmark Nigerian Supreme Court judgment on the case of Abacha Vs. Fawehinmi. United Nations charter on the rights of indigenous people and African Charter, which was ratified and signed by Nigeria, are still in place till today and overrides the Nigerian Constitution. We are warning the vocal few rented saboteurs and uneducated public commentators in Nigeria to stop the perverse insinuation that Biafra agitation is all about war. IPOB is not asking for war, rather what we are asking for is self-determination and the only way to achieve that is through the internationally recognized instrument of a referendum.